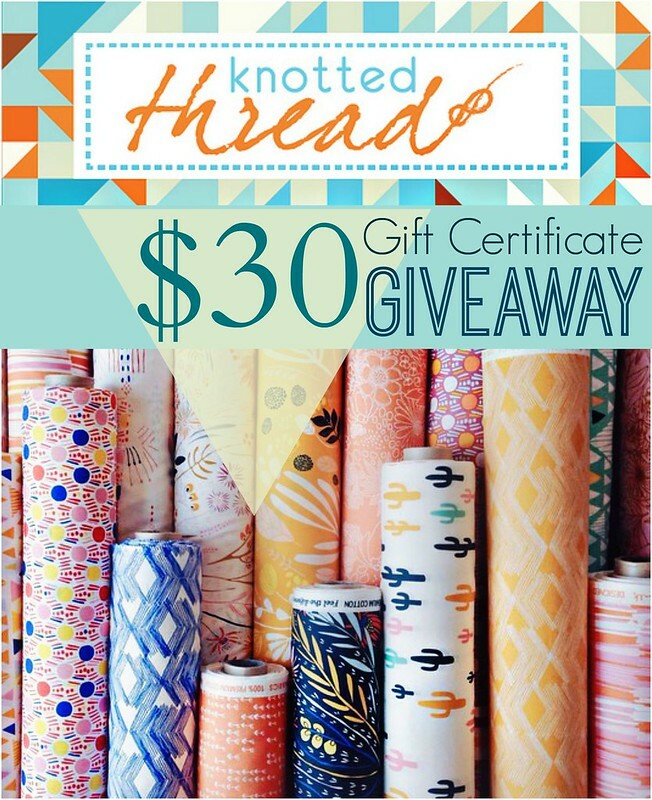 For this week's Fabric Giveaway Friday, the Knotted Thread is offering a generous $30 Gift Certificate to one lucky MCH reader! That’s 4 possible entries! Enter now through Monday, June 20th!! Winner will be picked at random and I will announce their name at the bottom of this post, here on the blog! Thanks to all who entered our Giveaway! From 462 comments the lucky comment number chosen at random is #405, Patty D from NC! Congratulations Patty, I will be in touch shortly!! I am ready to win this!!! I already follow you on Facebook...of course!!! I get the Knotted Thread newsletter already! What a lovely prize! I'd be happy to win it. What a clean contemporary collection. Love it. Already subscribe to Knotted Thread emails. This is wonderful - hope I am lucky. I receive Knotted Thread's newsletter. Always can you stash money. I am a follow you. I pinned the giveaway https://www.pinterest.com/pin/4292562122009125/. What a beautiful selection of fabric just in that one photo! We love to shop. Thanks for the chance to win. I follow you on blogspot! Thank you for the opportunity to add to my ...stash, yes essential stash! I follow Maureen via Bloglovin'. I receive the newsletter from Knotted Thread. Thanks to the Knotted Thread for the gift certificate. Thanks for a chance in the giveaway. I'm adding to my stash so that I can make a very scrappy quilt. I'm planning a couple new quilt projects, so this gift certificate would be put to good use! GCs are such nice prizes to win! Thanks Knotted Thread for a lovely giveaway. What's not to enjoy? Thank you Knotted Thread and Maureen! Your sponsors are very generous. Yeah, free fabric. I hope that you and your family are having a nice time at the beach. Thrilled to have a chance to enter the giveaway! Some fabric shopping - sign me up! Thanks!! I have subscribed to Knotted-Thread. Great selection! Thanks for the giveaway, Jenn and Maureen! I follow you via my RSS feed. glad to see you had a great vacation ! I've signed up for theeir newsletter! :) Happy Friday!!!! Thanks Maureen for all these giveaways! ALREADY SUBSCRIBED TO KNOTTED THREAD'S NEWSLETTER! NEAT GIVEAWAY! THANKS TO YOU+KNOTTED THREAD! What a fabulous give away! Thank you for the opportunity to win! Have a great day creating! I signed up for the newsletter even before I had read the whole post, those fabrics are gorgeous and I wanted to see more! Thank you again for having the giveaway...I sure would be delighted to win! So glad I went back and reread the details...I follow you by email and really enjoy reading your posts! Glad that I was lead to your blog. Have a great day! Great giveaway-always like Christmas when you have a gift certificate to use! I follow your blog by email and on Facebook! Another great giveaway I'd like to win! I pin you frequently so my daughter can see what interests me!! I love the selection Knotted Thread has! My birthday is coming up. This would be an awesome birthday present for my double nickel birthday! Currently working on a quilt for our youngest grandchild. When this is done, I will have made a baby and a twin sized quilt for each of our ten grandchildren. So many lovelies at the Knotted Thread. I'm working on my Christmas quilts, and often browse there, looking for the perfect thing to bring a "spark" to that special gift. I follow you by email, Maureen. I receive the Knotted Thread email: wordygirl at earthlink dot net. Thank you for the chance to win. I've done such a good job of sewing my stash (especially those charms from swaps) this year but backings aren't something I buy ahead of time. I would use the gift certificate for a backing. I would love to buy some fabric. I receive The Knotted Thread's newsletter. Thanks! She has some pretty fabrics I'd like to own! Thanks for the giveaway! I could sure use it... have a new grand baby that needs a quilt from grandma!!! I follow you via email Maureen!! Thanks for the inspiration! This is an exciting line. I visited The Knotted Thread and signed up for their newsletter. I was subscribed to their blog but she hasn't updated it in like a year so I just quit following her yesterday. Darn. Oh well, I still follow you! happy friday indeed! thanks for hosting such fun prizes. Happy Friday, thanks for the chance! Hope you had a great time on your vacation! Such lovely fabrics to choose from at Knotted Thread! I am signed up for the Knotted Thread newsletter.